Last year at San Diego Comic-Con, Peter Capaldi took a bow as Doctor Who at Hall H; this year, for the first time ever, members of BBC's "Doctor Who" appeared together in Hall H on Thursday to tease fans with the new season's secrets and explain the new possibilities with the first ever female "Doctor Who." Peter Capaldi's Doctor Who, number 12, left this world by "cheating death" as all Time Lords have. His final words were: "Hate is always foolish. Love is always wise. Always try to be nice and never fail to be kind. Oh, and you mustn't tell anyone your name; no one would understand it anyway." And then, when fans finally saw the transformation during the end of the 2017 Christmas special, "Twice Upon a Time," the new Doctor was Jodie Whittaker. At the start of this year's panel which included Jodie Whittaker (Doctor Who), Tosin Cole (Ryan), Mandip Gill (Yasmin), Chris Chibnall and Matt Strevens and was moderated by IGN's editorial manager Terri Schwartz, clips of fan reactions across the world for Lucky Thirteen (including Meryl Streep who said, "I think it's about time") flashed on the screen. For 12 iterations, Doctor Who has always been a white male, ready to fight the Daleks and other monsters with his brain. Each has had a distinctive fashion style to the delight of Cosplayers—both male and female. Number 13 expresses what Cosplayers have always known: There is no reason that this alien from the planet Gallifrey should always be a man. The gender change was heavily hinted at in the last season. The Time Lords escape death by regenerating, transforming into a new entity and this regeneration was ground breaking and left some female fans in tears. The gender is not the only change for this coming season. Steven Moffat, who had been the showrunner, head writer and producer since 2010, stepped down to be replaced by Chris Chibnall. The switch to a female Doctor was "possibly overdue," Chibnall stated. It was "really simple and obvious." When asked how he chose the new doctor and her companions, Chibnall said, "They all came in and auditioned and they were all amazing." He wrote three special audition scenes and for Whittaker, he said, "She just walked in the room and she was the doctor ... You don't know what you're looking for until you see it." He loved the "energy she brought was the doctor; it was new; it was fresh." As a writer, he said he loves it when you "see an audition and you just want to write for it because it suggests scenes." Yet because he had worked with Whittaker before, he made her do not only the first scene which easily won Chibnall over, but two more. Whittaker admitted during the panel that she so badly wanted the part, she made her own props. In one scene that involved her defusing a bomb, a prop she had made from a shoe box with wires. "I absolutely nailed it," she exclaimed. Teaming up Chibnall and Whittaker again, also fomented fan suggestions. For those who don't know, another reason for Whovian excitement is because not only has Chibnall worked with Whittaker before, but that particular project was the crime drama "Broadchurch" where from 2013 to 2017 Whittaker played supporting character Beth Latimer with the tenth Doctor Who, David Tennant, playing the male lead. Before any of that happens, of course, one needs to solidify this Doctor's personality. Chibnall said, no matter what, "The Doctor is still the Doctor." But he also admitted that in some cases there will be "some situations where there are gender issues." Her new companions are Tosin Cole and Mandip Gill who both were at the panel and Bradley Walsh, who could not attend. Chibnall explained, he was looking for people with an incredible range and had an "emotional truth" that was important to the show. "The chemistry was really apparent." Cole explained it as, "I needed a job so I went in there did my job and I hopefully did it right and they gave me a job so now I'm doing my job." He also admitted, "I didn't know Jodie was the doctor." He further explained during the audition he thought, "Yeah there was a woman reading the doctor's lines, who is she there?" On the audition process, Gill commented, "It's written so well there was so much in the characters. We weren't told what it was" because on the script they used "fake names." Gill said, "There was so much in the script that I didn't need to do an awful lot. I just needed to turn up and had fun." Gill described her character as a 19-year-old girl from Sheffield, "She thinks she can do a little bit more and she asks for a little bit more and she gets a little bit more and she's whisked away on this amazing adventure." She might question what she's doing but she goes along with it, being in awe of the Doctor. Of Bradley Walsh, she said, "He's the funniest man I've ever had the pleasure of working with." Whittaker interjected, "He's just daft ... He's a grown man but he's like a child." "He's so naughty it's unreal," Gill added. Apparently he's a practical joker. Walsh did appear in a special clip during the panel. If they could go anywhere in the TARDIS, Whittaker would go a hundred years in the future; Cole, New York in the '80s; Gill would go back to see how the pyramids were made and if it really was aliens; Chibnall would go back to a certain club in 1962 when the Beatles were playing a lunchtime set; and Strevens would go back to 1969 Las Vegas to see Elvis perform. During the preceding press conference, Chibnall revealed there would be all new stories and all new villains and one doesn't need an encyclopedic knowledge of the show's history, making it a great time for new fans to join in. Growing up, Whittaker noted that it wasn't easy always seeing people "who didn't look like or sound like us." Whittaker also said that when she acts, she isn't thinking about how being female is different. After all, that's all she has known. 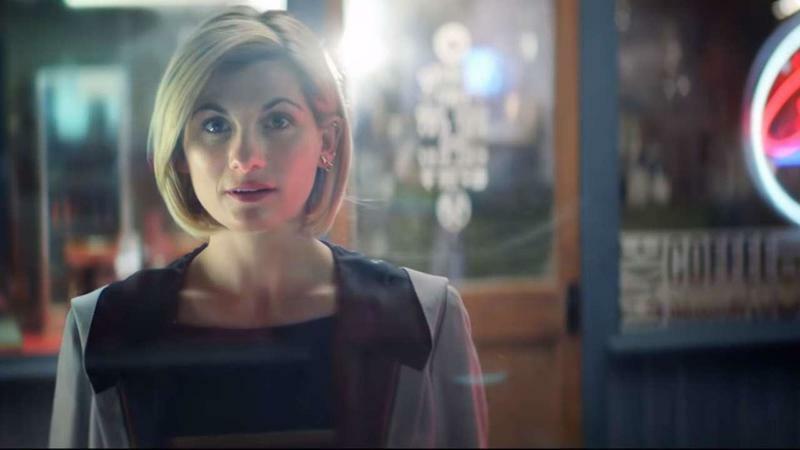 "It will be really exciting when women aren't treated as a genre" and for boys, a female Doctor Who can show "that it's okay to look up to a woman." The new season's trailer has the Doctor saying, "All of this is new to me: new faces, new worlds, new times. So if I ask you really really nicely, would you be my new best friend?" Chibnall said the first episode will air in Fall 2018 on the same day in both the UK and the US. At SDCC, there were already men and women, girls and boys dressed up as the new Doctor, lining up to buy the new sonic screwdriver, seeming ready to join Whittaker and her friends on this new era for Doctor Who.